Taking inspiration from the Carolinas, this rub will help you unlock your inner Pitmaster. The genuine blend of spices, garlic and onion will transform your slow cooked pork shoulder into a dish worthy of worship. Once cooked, smother in Red’s Unholy BBQ sauce and the meat juices from the tray for a truly authentic flavour. 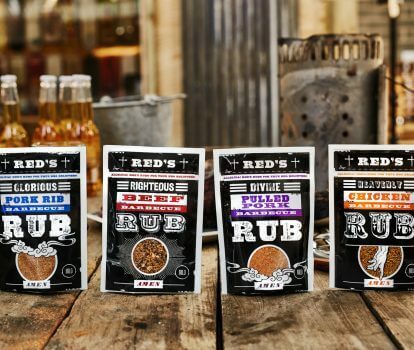 Inspired by the BBQ pits of Memphis, Tennessee, this rub will turn out full flavoured racks every time, whether you love meaty baby backs or tender spare ribs. Once marinated, either roast in the oven, or better still smoke in your BBQ. 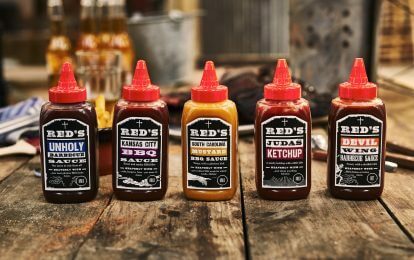 Before serving why not brush your ribs with Red’s Kansas City BBQ Sauce for a true taste of the American south. It’s time tobless your chicken, and transform it from a poultry dish to a heavenly offering. A blend of spices, herbs, onion and garlic will infuse your chicken with BBQ goodness. Give it a final twist and pimp it up by adding a coating of Red’s Devil Wing BBQ Sauce. Start on your path to salvation and send your steaks to heaven. Simply sprinkle over the meat before you hot fry or grill and allow the blend of spices, pepper and herbs to bless your plate. Learn the ways of true barbecue and cook a pre-rubbed beef brisket low and slow in your smoker to unleash the inner Pitmaster in you.